In Nepal, nearly 70 percent of infant deaths occur within the first month of life, the most common cause being infection. 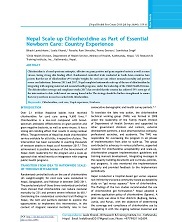 The Chlorhexidine Navi (Cord) Care Program (CNCP) worked to reduce newborn deaths in Nepal through the use of Chlorhexidine (CHX) gel for umbilical cord care to prevent neonatal sepsis. The project supported the scale up of Chlorhexidine in 100% of public facilities across Nepal, as well as in a number of private facilities. By the end of the project, Chlorhexidine had been applied to the umbilical cords of 2.1 million newborns in Nepal, preventing an estimated 9,600 newborn deaths. Working with a local pharmaceutical firm and the Ministry of Health, JSI rapidly and sustainably increased demand, availability, and use of the product on a national scale. With support from CNCP and the Ministry of Health, 44,171 Female Community Health Volunteers (FCHVs), 15,437 health workers across all public health facilities, and 2,860 health workers in 79 private health facilities were trained in Chlorhexidine counselling and application over the life of the project. Following the earthquakes in 2015, CNCP quickly mobilized FCHVs and staff to respond in the 15 districts most affected and ensure the availability of this lifesaving product. CNCP’s reach expanded beyond Nepal to provide technical support to other countries introducing and scaling up Chlorhexidine use. Nepal was a destination for study tours and learning visits for international delegates from 20 countries who wanted to see Chlorhexidine cord care in practice and understand the Chlorhexidine program and Nepal’s government commitment. In addition, CNCP provided short-term technical assistance to other countries to initiate their own Chlorhexidine programs. Learn more at the USAID Stories site, where CNCP's work is profiled in an article called: Nepal's Navel Glazers: How thousands of women, armed with a little tube and lots of heart, are changing minds and saving lives. Watch a video to see how better cord care is saving newborn lives in Nepal. JSI's work introducing Chlorhexidine in Nepal was featured in a video on Public Radio International.